With the original i3 EV, BMW aimed to apply its engineering prowess in unconventional ways-not just with weight-saving construction techniques that mated a carbon-fiber composite passenger cell to a mostly aluminum chassis, but also with eco-friendly elements such as natural-fiber cabin finishes, leather seats tanned with an olive-oil extract, a key fob made of a castor-oil-based polymer, and hemp-reinforced interior plastics. The driving experience wasn't exactly forgotten, but it played second fiddle to the feel-good sustainability overtures. Fast forward nearly five years, and the present reality is that the i3's sales have been well short of original expectations and downright lackluster in contrast to the rabid demand for the new Tesla Model 3 (BMW targeted Tesla with the original i3 launch). Munich’s answer to stoke interest, it seems, is to step back a bit and embrace traditional BMW dynamic virtues. Thus the new-for-2018 i3s tested here. That lowercase s denotes some extra kick in the form of a higher-output motor-in this case, 184 horsepower and 199 lb-ft of torque, 14 ponies and 15 lb-ft more than in the standard i3. Wider tires, fender flares, and a lower ride height improve the curbside stance and hint at the stiffer suspension tune. 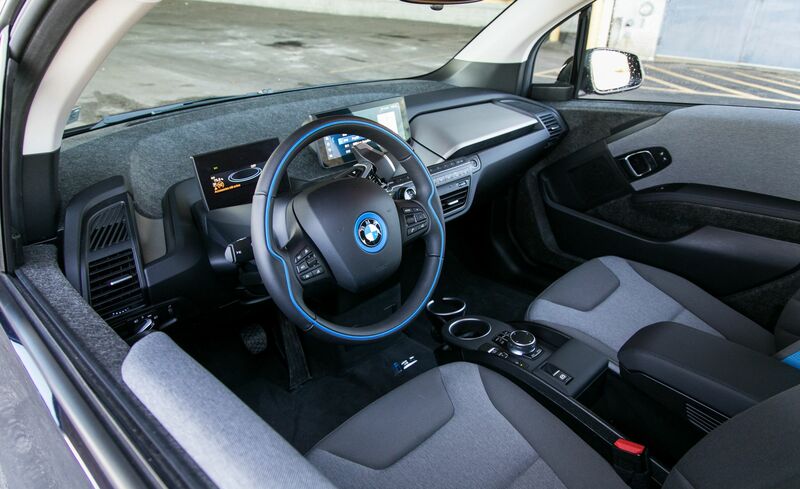 Inside, drivers will find something that has been missing from the i3 lineup all along: a Sport driving mode. There’s also an attractive facelift to many of the trims and surfaces. After track testing and hundreds of miles of city and highway driving, we still won’t call this racier i3s anything close to exhilarating, but it is incrementally quicker (and faster) by the numbers and noticeably zippier from the driver’s seat. We tested both i3s models, including the REx version-which means it had the additional range-extending 38-hp, 647-cc two-cylinder engine and dedicated generator tucked under the rear cargo floor-as well as the standard car powered solely by electrons. While both feature the same 33.2-kWh lithium-ion battery pack, foregoing the range-entending option saves 274 pounds at the curb. 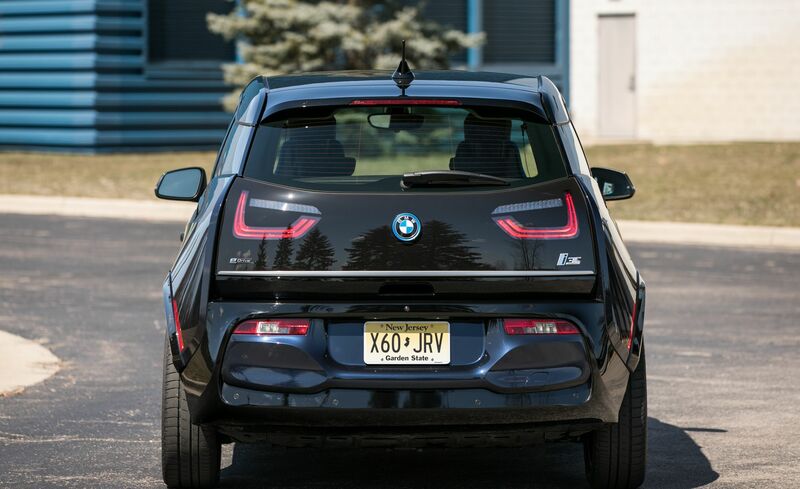 The i3s's power boost pares the REx version's zero-to-60-mph time to 6.8 seconds, versus 7.2 seconds for the last i3 REx we tested, and to 6.3 seconds for the EV model, a 0.3-second improvement over the i3. That’s roughly comparable to the Chevrolet Bolt EV, which accelerates to 60 mph in 6.5 seconds, but the Tesla Model 3 needs only 5.1 in its Long Range, rear-wheel-drive configuration. The i3s solidly outruns the latest Nissan Leaf (7.4 seconds) as well as the Volkswagen e-Golf (8.5). The 2018 i3s covered the quarter-mile in 15.3 seconds in range-extender guise and in 15.0 flat as an EV, both with a trap speed of 93 mph-improvements of 0.7 and 0.5 second, respectively. The i3s REx tops out at 100 mph, and 99 mph for the EV, up from 92 and 91 mph, by keeping the same gear ratio (there’s only one) but allowing a higher peak motor speed (11,900 rpm versus 11,400), with new tapered roller bearings for the motor. The tires are sized 175/55R-20 in front and 195/50R-20 out back, which are large only by comparison to the base model’s front 155/70R-19s and rear 175/60R-19s. They’re still Bridgestone Ecopias, engineered for low rolling resistance more than traction, but this car’s roadholding, measured on the skidpad at 0.84 g (REx) and 0.87 g (EV), was well beyond the 0.77 g of grip the standard i3 generates. Braking for the REx was a consistent-and consistently good-163 feet from 70 mph, with the lighter EV faring a touch better at 156 feet. That’s a huge improvement over the 184 feet it took to stop the 2017 i3 REx we tested (the non-s EV required 177 feet), and much better than the 181-foot stops recorded by the VW e-Golf and the Chevy Bolt. As before, the i3 offers drivers the choice among Comfort, Eco Pro, and Eco Pro+ driving modes, but the i3s also adds the aforementioned Sport mode. The dampers aren’t adaptive, so this mode simply dials up a more aggressive tune for how the motor responds to the accelerator, and it also makes the steering slightly heavier. Given the overboosted nature of the steering in the other modes, this is where the calibration should have been all along. 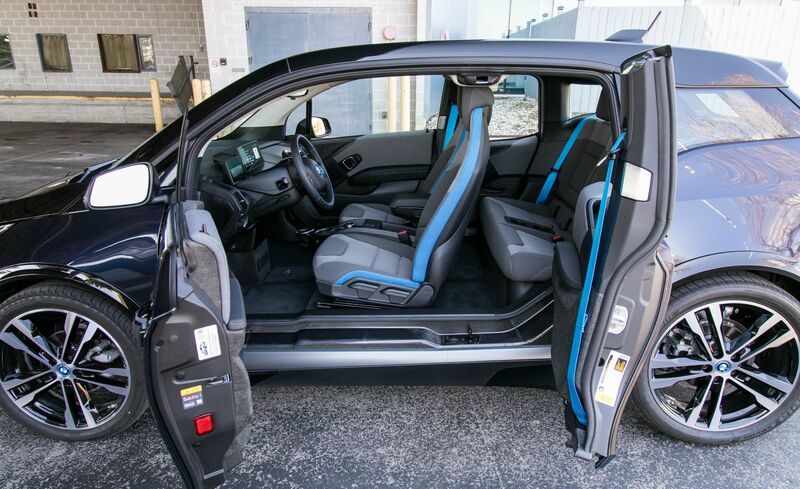 The i3s is in its element in the city; occupants sit upright, with great forward visibility. Punchy and instantaneous response from the electric motor, predictable regenerative braking (you can minimize your use of the brake pedal if you anticipate the drivetrain’s retardation), precise steering, and good body control all make the i3s great for the urban autocross. At 75 mph, however, it’s quite different; the steering still feels a bit too touchy even in Sport mode, as crosswinds can create unease, and the narrow front track tends to induce tramlining. But any impressions of instability are countered when you press the i3s harder and closer to its dynamic limits. It wouldn’t be our first or even second choice for entertainment on two-lane country roads, but it can cope well enough for an upright box, not only producing more grip but also cornering flatter than the standard i3. In the tightest corners there’s a bit of a learning curve, although it’s not what you might think for this short-wheelbase, rear-wheel-drive car with a strong rearward weight bias. Oversteer is not on the dry-pavement bill of fare, and front grip remains in short supply. Given the strong, instantaneous response from the electric motor, you have to wait a split second longer than you would with a gasoline-powered car before requesting power, so as to avoid understeer when exiting tighter corners. In REx form, opting for the i3s doesn’t have any effect on this green machine’s bragging rights. The EPA rates it with a driving range of 97 miles on the battery pack, plus another 83 miles with a fill of what amounts to a 2.3-gallon jerry can. The two-cylinder engine fires up and drinks from that meager supply only when the battery is nearly depleted. There’s no mechanical connection between the engine and the drive wheels, so it only plays the role of an onboard generator. The i3s EV, in contrast, is rated at 107 miles of driving range and a combined 112 MPGe versus the standard i3 EV's 112-mile and 118-MPGe figures. Electric vehicles-especially the small-city-car set-tend to shortchange drivers on real-world highway range when compared with their published estimates, yet the i3 is an exception. 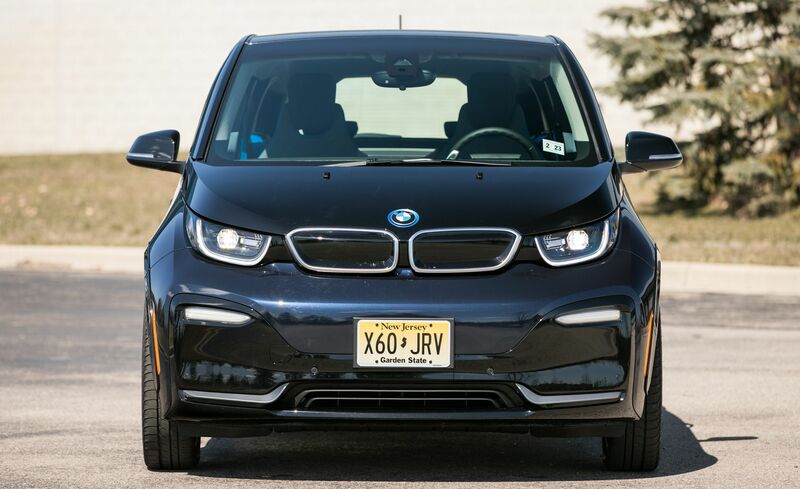 On our 75-mph highway fuel-economy test, the i3s REx returned 82 MPGe over 78 miles, then the generator kicked on to the tune of 24 mpg. In a less controlled experiment, one editor coaxed more than 100 miles out of the battery while traveling on the highway at a slightly slower pace before the range extender kicked on. Then, after recharging, we traveled 108 miles, in city and suburban driving, switching between the Comfort and Sport modes, after which the range meter estimated another 21 miles of charge remaining. Range anxiety kept the driver from seeing how far below “E” he could go. Either way, comparing the two different “tests” is a pretty good indication that driving an i3 in a city is way more efficient than on a road trip. The i3s EV, with no secondary power source to pad its range limitations, is even more at home around town, yet it still returned a decent 89 MPGe on our highway fuel-economy test. Once you’ve zapped through the electrons of a full charge, the options aren’t as bright in the REx version. Drive the battery’s charge down to about 6.5 percent of capacity and the range extender spins to life-gently at first and barely noticeably, but if you’re going up a long grade or in the passing lane, it can get quite boomy as it struggles to feed enough energy into the system. And with the extender’s separate range display steadfastly suggesting you can expect only about 70 miles from a full tank, you experience a different kind of range anxiety here, requiring a gas stop at least every hour. If you happen to find a CCS-format DC fast charger, you can recover an 80-percent charge in about 30 minutes in either i3s-but as we found on a drive in the REx on I-5 from Portland toward Seattle, they’re not spaced quite right to stay in full-electric mode without some next-level (read time-wasting hypermiling) dedication. Even after five years, the i3’s striking styling looks like it was conceived for science-fiction movies and design magazines. But with the i3’s updates for 2018, this latest model looks to be tucked a little closer to the traditional BMW fold. 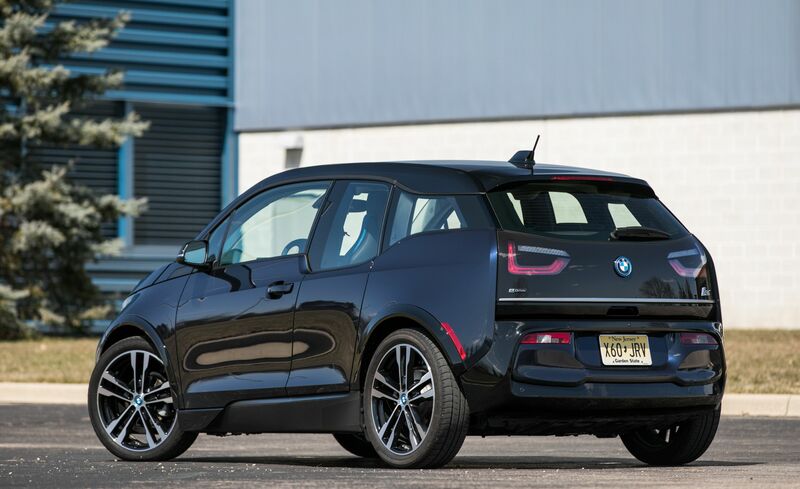 The only thing that doesn’t seem in character for the i3s is the full-width chrome bar across the back-something that we’d seek to black out if we owned one. In either configuration, the i3s commands a $3200 upcharge over the standard car, with EV and REx base prices-$48,645 and $52,495, respectively-straddling the $50,200 that Tesla asks for its no-options Long-Range Model 3. 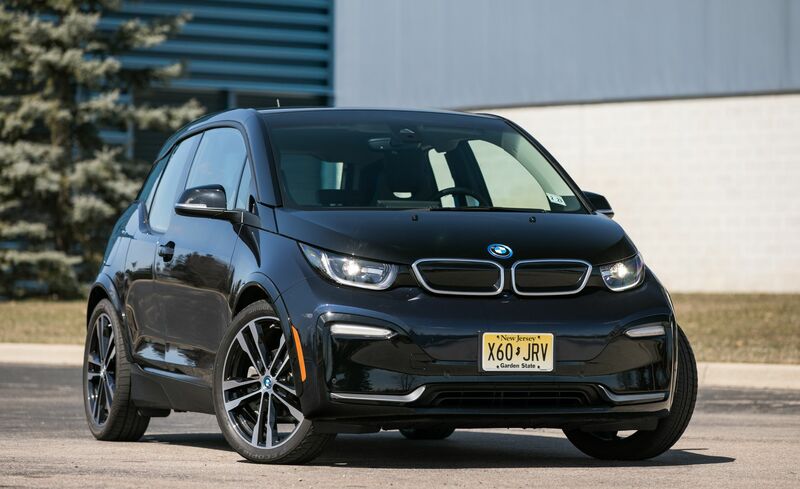 As tested, our i3s test car came to $53,045 with the $2500 Technology + Driving Assist package (adaptive cruise control and navigation), $750 Park Distance Control sensors, $550 Imperial Blue Metallic paint, $300 blue seat belts, and another $300 for Apple CarPlay. 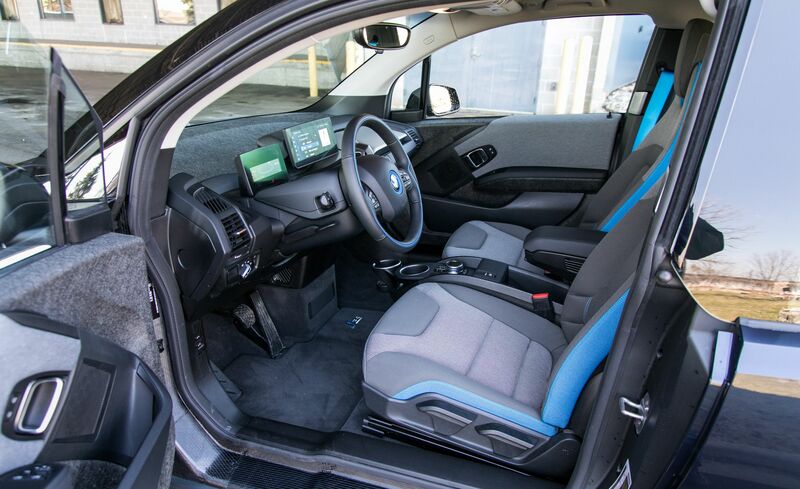 The i3s REx pushed its final tally to $58,695 with a similar load of options, plus the $1800 Giga World interior appearance package (Light Eucalyptus wood trim, upgraded leather and cloth upholstery, and a smoker's package). BMW’s iDrive infotainment system is one of the most seamless for Apple CarPlay connectivity-as it should for what BMW charges for it. Once the phone is paired and CarPlay is enabled, it just works, wirelessly, and is an integrated part of iDrive each time you get back in the car-no barrage of prompts or popups required. Although the i3 might make better sense in Europe, here in the United States it has always felt a little bit like you’re missing out on something, despite the hefty entry fee Munich charges for its electric runabout. Now with the Tesla Model 3, Chevrolet Bolt, and a long list of EVs soon to arrive presenting more traditional designs, four real doors, more passenger space, and (perhaps of most value) EPA-estimated driving ranges of more than 200 miles, BMW is smart to focus on its roots as a maker of driver’s cars in seeking to differentiate the i3 in an increasingly crowded space, even if the s model's sportier aspirations amount to a minor enhancement. (Note: We originally tested the BMW i3 with a range-extending two-cylinder engine in June 2018. We have since updated this story with test results and photos of the full-electric version of the model.